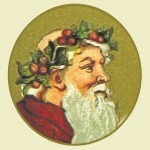 This ever-growing collection of Christmas images have been selected for crafters by a crafter. I try my best to include those images that are crisp enough and pretty enough that I would want to use them in my own projects. Whether you create scrapbook pages, mixed media art, ornaments, Christmas cards and stationary or websites we hope you will find exactly what you need from our collection of copyright free downloadable images. Be sure to check our Children in Winter Scenes for some additional winter and free Christmas images that feature children but may not have a distinctive feel of Christmas. All of the Christmas images you will find on Reusable Art are fully in the public domain in any country which follows the Berne standard. 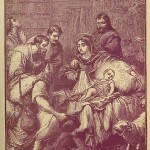 There is also a selection of Nativity Paintings that are also fully in the public domain my site, The Famous Artists. If, on the off chance you still can’t find what you are looking for, I also have a growing collection of American Christmas Graphics which are out of copyright in the United States but may not be in the public domain everywhere on my newest site Free Vintage Art. Deck the halls with boughs of holly . 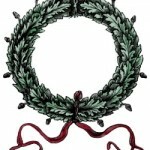 . . and wreaths and all sorts of other lovely Christmas decoration images. 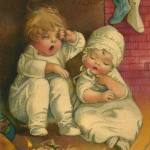 Santa in his red suit may be a more modern concept but children have been hanging stockings by the fireplace with care for generations as illustrated by these charming Christmas images. The Night Before Christmas, that charming poem written by Clement C. Moore has been published many times since 1823. These Christmas illustrations are from those books. 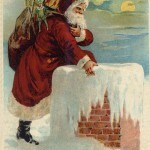 Vintage book, magazine and advertising images of Santa Claus. All too often, amid the decorations we forget what Christmas really means. These vintage Nativity images put the reason back into the holiday season. 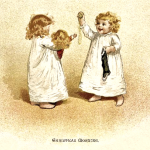 Elves, Christmas angels, gifts and other great images of Christmas can be found here.